Click here for a current area map. Data Collected by the US Army Corps of Engineers. Compiled by Huntingdon Area Midle School students. Teachers: Joe Jaroskick and Matt Baker. Copiied from the 1998 Raystown Country Guide. Raystown Country Visitors Bureau. These are places where people play including beaches, lakes, rivers, ski runs, and ammusment parks. Greenwood Furnace State Park off of Route 305, North of Huntingdon. (814) 667-1800. Monroe Furnace off of Route 26 North of Huntingdon. Juniata Valley Audubon Society, Canoe Creek off Route 22 West of Huntingdon. Lake Raystown, an Army Corps of Engineers lake, provides miles of great lake life -- fishing, skiing, boating, swimming, or just relaxing. For details on the lake, see the U.S. Army Corps of Engineers information page This is also the site of the Raystown Regatta. Lake Raystown Resort and water slide (play area) on Lake Raystown off of Route 994. They also offer boat tours. (814) 658-3500. Tatman Run Park off of Route 994. Warriors Path State Park south near Saxton. River Outfitter Adventure Marine Ltd. Canoe and Kayak river trips, rentals a sales. (814) 623-1821. East Broad Top Railroad A narrow gauge operating railroad system in Central Pennsylvania. It is the last narrow gauge RR in the United States east of the Mississippi and listed as one of the 11 most endangered historical sites in the country. The railroad has several operating steam engines and cars. There is even an operational round table. Next door is the trolley museum with working trolleys. Both offer rides. Check it out. Any purchases support the efforts to save and restore the systems. These are places to buy or rent toys like boats, motorcycles, skis, horses, snowmobiles, and similar toys. Shy Beaver Pro Shop From a Jon boat through luxury cruiser, tow rope through HO Watersports ski equipment, jig through Lowrance Electronic equipment, local fishing hotspots through Bass Masters, nic-nacks through nautical gifts, bikini's through wet suits, boat maintenance through boat sales, if it is water fun you are looking for, check out Shy Beaver Pro Shop. Located on Highway 26 south of Huntingdon, near lake Raystown, in the heart of Central Pennsylvania, award winning Shy Beaver Pro Shop has what you desire. Seven Points Marina Boat Rentals, Houseboat Rentals, Cruises on Beautiful Raystown Lake (814) 658-3074. Huston Ford Lincoln Mercury - Central Pennsylvania's oldest family owned Ford Lincoln Mercury dealership. These are names, numbers and other information about local guides. RR#1 Box 1450, James Creek, PA 16657 (814) 658-2088. Trophy Guide Service, Inc. 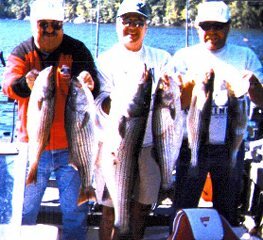 The only Raystown Lake fishing guide service to catch state record stripers! The longest-running guide service on Raystown Lake.-- (814) 627-5231. Yocum's Fishing Guide Service (814) 643-7105. Raystown Lunker Guide Service (guide Fred Davoli) (814) 643-0609. These are places to stay including B&B, Campgrounds, cabins, rentals, hotels, motels, and house boats. The Inn at Solvang is situated four miles north of Huntingdon on Route 26. Surrounded by forests and spacious lawns, the three story, brick southern colonial home provides a tranquil retreat, or a gracious alternative to motel or hotel accommodations. Privacy is yours as well as the convenience of an innkeeper just steps away. Banquet facilites are available. Online reservation requests available. Aunt Susie's Country Vacations B&B in Hesston, south of Huntingdon on RT 26, (814) 658-3638. Maple Shade B&B (814) 627-0488. Weaver's Ridge near Saxton, south of Huntingdon on RT 26 S, (814) 635-3730. Boyer's Campground, Hesston area, south of Huntingdon on RT 26 (814) 658-3901. Juniata River Campground in Lewistown, (717) 242-0465. Lake Raystown Family Camping Resort (814) 643-3377. Lake Raystown Resort on Lake Raystown off of Route 994. (814) 658-3500 or (800) 628-4262. Pleasant Hills Campground on Route 26 seven miles South of Huntingdon (814) 658-3986. Robinson's Hideaway Campground near Trough Creek State Park (814) 658-3663. Trough Creek State Park off of Route 994. Camping and cabin rentals. (814) 658-3847. Lane's Country Homestead near Todd off of Route 994 (814) 448-3351. Uncle Joe's Cabin Rentals (814) 643-0838. Ripka's Cottages off of Route 22 near Huntingdon (814) 643-4206. Raystown Lakehouse near Shy Beaver Boat Launch (610) 398-2806. Lake Cottages near Seven Points near Hesston south of Huntingdon on RT 26 S (814) 658-3824. Lay-Z Pine Lane Cabin, in Hesston, south of Huntingdon on RT 26, (717) 236-8115. Aunt Susie's Country Vacations in Hesston, south of Huntingdon on RT 26, (814) 658-3638. Days Inn, Huntingdon -- (814) 643-3934. Huntingdon Motor Inn -- (814) 643-1133. These are places which serve prepared food. Miller's Diner, Mill Creek on Route 22 three miles east of Huntingdon. (814) 643-3418. These are places to meet other people including bars, taverns, dance halls and the like. These are area attractions including museums, historical sites and the like. Indian Caverns with guided tours off of Route 45, North of Huntingdon in Spruce Creek. (814) 632-7578. Lincoln Caverns with guided tours off of Route 22 West of Huntingdon. (814) 643-0268. Pennsylvania State Correctional Institution (no stoping), built in 1882-1887 on Route 26 just off Route 22 in Huntingdon. HUNT Railroad Tower (5th and Allegheny), Huntingdon. Built in 1899, this mechanical switching house now houses a transportation museum. (814) 643-1110. Swigart Antique Car Museum, Rt. 22 East of Huntingdon (Older than the Henry Ford Museum). Antique cars and toys. East Broad Top Railroad A narrow gauge operating railroad system. It is the last narrow gauge RR in the United States east of the Mississippi and listed as one of the 11 most endangered historical sites in the country. The railroad has several operating steam engines and cars. There is even an operational round table. Next door is the trolley museum with working trolleys. Both offer rides. Check it out. Any purchases support the efforts to save and restore the systems. Located near Orbsonia and Rock Hill. These are places to shop including specialty shops. Shy Beaver Pro Shop From a Jon boat through luxury cruiser, tow rope through HO Watersports ski equipment, jig through Lowrance Electronic equipment, nic-nacks through nautical gifts, bikini's through wet suits, if it is water fun you are looking for, check out Shy Beaver Pro Shop. Located on Highway 26 south of Huntingdon, near lake Raystown, in the heart of Central Pennsylvania, award winning Shy Beaver Pro Shop has what you desire. The Sheepskin Country Store on Route 30 4 miles west of Breezewood. Zebrovka Ranch. "The Place Where the Bison Graze". Bison and herbs products. (814) 643-6915. These are places to buy what you for got to bring. Shy Beaver Pro Shop Boating, Skiing, Fishing, or Swimming supplies, if it is water fun you are looking for, check out Shy Beaver Pro Shop. Located on Highway 26 south of Huntingdon, near lake Raystown, in the heart of Central Pennsylvania, award winning Shy Beaver Pro Shop has what you desire. Brennemans Meat Market, 10th street, Smithfield (Huntingdon). Giant Foods, Bi-Lo and AMES are all located in Huntingdon. Ninth Street Market in Huntingdon (on ninth street of course). Propane tank swap at the BP station on Route 22 in Huntingdon. US Army Corps of Engineers - Lake Raystown. North East -- The Big Valley, PA including Belleville. East -- Lewistown and Hershey, PA.
South -- Bedford and Breezewood, PA and Berkeley Springs, WV. West -- Altoona and Johnstown, PA.